I went to Spaceweather.com. 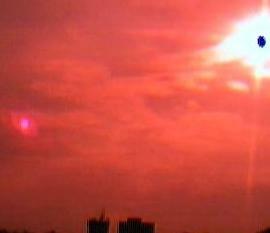 Check out the photo from the hurricaine cirris clouds this guy took of the Sun. What's that next to the Sun? Halos around the sun often presage bad weather, says atmospheric optics expert Les Cowley. The reason: Cirrostratus clouds on the leading edge of storm fronts contain halo-forming ice crystals. Such was the case today when Hurricane Isabel hit the United States. Sky watcher Bob Colwell took this picture from Berwick, Maine: These halos were the brightest that I have ever witnessed in New England, says Colwell. 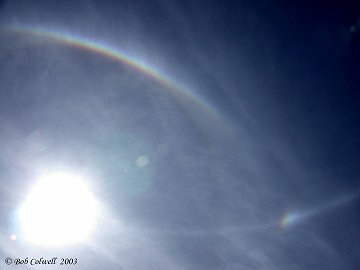 Sundogs appear along the edge of the halo, as the sundog at the right hand side, producing a rainbow, also another characteristic of sundogs. 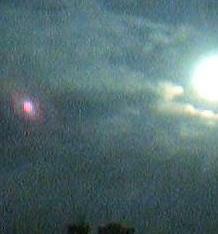 But the object that is a distinct pink sphere next to the Sun, here shown at the 8 o'clock position, is not a sundog. In addition, this Sun is clearly not round, but bulging off to the side, including light from another object off to the side a bit and in front of the Sun. 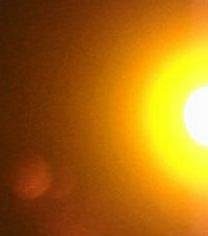 Have such occulted Suns and spherical pink personas appeared next to the Sun before? This is an attempt to create the impression that the Planet X personas are atmospheric phenomena, and when this excuse no longer works, it will become an asteroid swarm. Magnetic disturbances that are not timed with CME's are caused by cosmic solar flares, per NASA, and red dust that cannot be explained is from cosmic dust, per NASA. And what is causing the regular Global Quakes that happen when the Atlantic Rift is positioned vs a vs Planet X? A cosmic rhythm? Note also the number of images from the Northern Hemisphere, at this time, that show the complex at the 8 o'clock position.